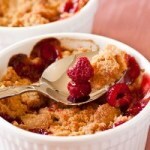 There is nothing more comforting than a sweet and tart apple and raspberry crumble on a cold winters night. Serve with a dollop of cream or ice cream. 1. Preheat the oven to 180 degrees celsuis (350 degrees farenheit). 2. In a bowl add the cubed apple and raspberries and add the sugar, flour, lemon zest and lemon juice and mix together until the fruit is coated. Pour the fruit into individual ramekins. 3. In a mixer bowl add the flour, sugars, salt, cinnamon and butter and mix until the butter is mixed in and the batter starts to form pea sized clumps. 4. Sprinkle the crumble topping over the fruit, making sure to not pat the mixture tightly. The looser the mixture the crumblier your crumble will be. 5. Bake in the oven for 40 to 45 minutes or until the crumble topping is golden and the juices start to bubble through the crumble topping. 6. Serve with vanilla bean ice cream or freshly whipped cream, or if you are feeling indulgent, both! Recipe adapted from Barefoot Contessa's Peach and Blueberry Crumbles.